My 20 years’ experience working in international development and philanthropy, most recently as head of philanthropy advice at ABN AMRO Private Banking in the Netherlands, have led me to two conclusions: first, both wealth and poverty have increasingly a female face; second, women represent the biggest untapped opportunity both for the financial world and for the world of social impact and social justice. Improving the life of a woman creates benefits not only for her but also for her family, the community in which she lives, and future generations. Women and girls are disproportionately affected by many of the world’s problems, such as poverty, lack of education and healthcare, violence, natural disasters and financial exclusion. This means that investing in the position of women and girls is a high-impact strategy that can bring transformative change. The bad news is that women and girls’ empowerment projects have to date received only 7 per cent of global philanthropic investments. Studies from Credit Suisse, Deloitte, McKinsey and others show that a significant women’s presence in any organization generates greater productivity, profitability and sustainability. Greater diversity in boards and management is empirically associated with higher returns on equity, higher price/book valuations and superior stock price performance. The diversity of thought and leadership styles that women can bring to a business will most likely give it a competitive advantage. Female philanthropists are also more generous than their male counterparts, according to a recent study in the Netherlands that ABN AMRO conducted in collaboration with Maastricht University. Dutch women philanthropists donate 3.6 per cent of their income, while men donate an average of 3.2 per cent. Strikingly, 20 per cent of female philanthropists donate to causes that promote the position of women, while only 5.4 per cent of men support women and girls’ causes. It also seems that wealth will increasingly land in the hands of women. According to a recent article in Forbes magazine, last year the number of female billionaires worldwide increased by 25 per cent. This is partly due to women’s greater involvement in business, but it is also because of the simple fact that women live longer. In the Netherlands, 40,000 women are widowed annually, compared with 14,000 men who become widowers. According to a US survey, 70 per cent of those who will inherit $41 billion over the next 40 years are women, while the recent ABN AMRO study cited above found that half of the female philanthropists inherited their wealth. If we are to believe the French economist Thomas Piketty, and the return on equity continues to exceed the growth of the economy, then the bulk of global capital will soon be in the hands of women. These trends suggest a great opportunity for those working in philanthropy, and an ever greater one for financial advisers. Women will in future control the majority of the world’s wealth. However, most women seem less comfortable with this role than their male counterparts. They need assistance in taking charge of their financial situation and future and those who help them will be rewarded through loyalty. But how can a predominantly male-oriented business which has traditionally focused on men reach out to women in a manner that is serious and authentic? The answer is simple: through philanthropy. Women are the motors of philanthropy and are deeply engaged in issues of social impact. These same issues are the gateway to build strong relationships with financial advisers. In the past year my Philanthropy Advice department has organized meetings entitled The Power of the Purse: Women, wealth and impact. We discuss the trends around women and wealth and women and poverty and the opportunities for women to create impact. The conferences are popular and fill up quickly, with sessions on themes such as estate planning and living wills. Greater awareness of the way both poverty and wealth are increasingly being feminized brings a desire to create impact. What I have learned is that philanthropy is not only important in itself, but also a safe space where women can become aware of their own ‘power of the purse’, of the impact they can create for their lives and the lives of other women. Moreover, it leads to their becoming more comfortable with finances and gaining essential financial skills. When a financial institution creates this important learning space, it builds trust and the beginning of a relationship. 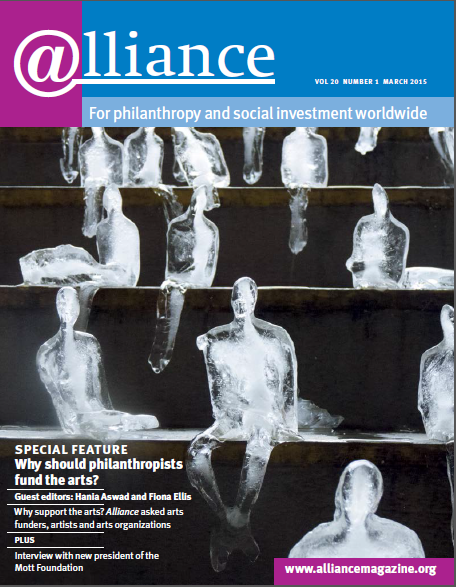 ^ See ‘Dutch millionaires using wealth for social ends’, Alliance, December 2014.